The John Deere Lawn Mower Front Wheel Drive JS26 is a medium priced self propelled lawn mower that will more than meet the needs of most consumers. 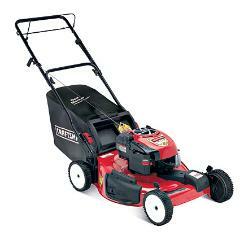 The combination of the famous Briggs and Stratton engine, the MowMentum drive system and the 3 in 1 deck system provides all that most consumers will need to mow the average sized lawn and then some. Add durable wheels and individual wheel adjusters with conveniently located controls and handlebars that fold down and are easily adjusted. 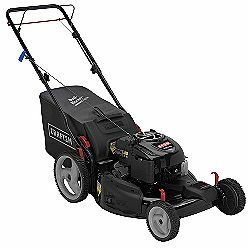 The Briggs and Stratton engine is designed to prevent flooding for easier starts without the need for priming or adjusting the choke. Add stabilizer to the fuel cap so that it drips into the fuel tank to ensure fresh fuel at all times. A special zone start system requires that the operator is located behind the handlebars using the extended recoil rope to start the engine while holding down the operator presence control located on the handle bar. The engine is designed to meet the California air emission standards and it uses a splash lubrication system to lubricate the engines moving parts. The momentum drive system on the John Deere Lawn Mower Front Wheel Drive JS26 allows for speeds from 0 miles per hour up to 3.6 miles per hour. The pivoting handle controls lawn mower speed. Control lawn mower speed by pivoting the handle. Operators can also lock in the speed by activating the drive lock located on the drive handle. The John Deere Lawn Mower Front Wheel Drive JS26 comes with a 22 inch steel deck and a 3 in one blade. Operators can choose between the side discharge, the rear bagging system or mulching the grass to return the nutrients to the lawn. A rear bag, mulch cover and side discharge deflector are included. The wheels are made of high impact plastic with rubber tread for increased traction and longer life. These wheels also have bushings for increased maneuverability and long life. Front wheels are 8 inches in diameter and the rear wheels are 9 inches in diameter. Adjust each wheel can be individually. Adjust cutting height from 1.2 inches to 4.2 inches with one lever for the rear wheels and individual levers for the front wheels. If you want the best mulching results , a cutting height of 3 to 4 inches is best to conceal clippings under the surface of the lawn and also not scalp the lawn. Fold the handle bars on the self propelled lawn mower for storage in tight locations. Adjust the handle bars of the John Deere Lawn Mower Front Wheel Drive JS26 . Adjust the handle bar height to match the height of the operator and their preference. There are 3 height adjustments provided. Tools are not required to make these adjustments. The engine speed is kept at a constant speed of 3350 rpm to provide the best quality cut. A wide handlebar enhances operator comfort with easy access to all controls. The zone control when depressed keeps the engine running and as soon as it is release the engine will stop immediately. This is an excellent safety feature that prevents many unnecessary accidents . Delivery: Purchase The John Deere Lawn Mower Front Wheel Drive JS26 online and at Lowes as well as local John Deere Dealers. 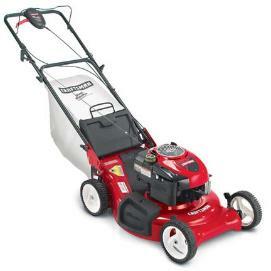 Customers can pick up and take their front wheel drive lawn mower at any of these dealers. 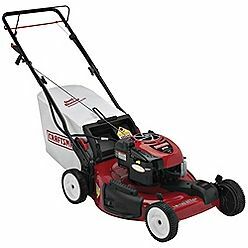 They can also have the lawn mowers delivered , however there will be a charge for delivery and it is far more economical to pick up the lawn mower yourself even if you need to borrow the neighbors van or car with a large trunk. The John Deere Lawn Mower Front Wheel Drive JS26 has an excellent safety control that should never be circumvented. The zone control prevents the operator from leaving the engine running while they walk away from the lawn mower. Prevent many accidents by using these types of devices. 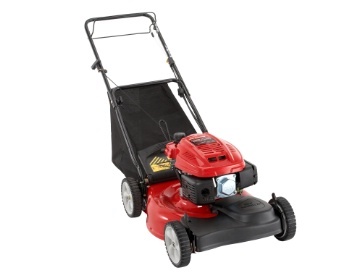 They are one of the best safety features added to today’s modern lawn mowers. Review all of the safety guidelines in the manual prior to starting the engine for the first time. Follow these guidelines at all times to avoid any possibility of accident. The John Deere Lawn Mower Front Wheel Drive JS26 comes equipped with a side discharge for grass cuttings. Take care not to allow anyone to stand in front of the side discharge to avoid being hit with any projectiles picked up by the lawn mower blade. Slow down around any objects and also around landscaping to avoid damaging the lawn mower. Maintenance of the John Deere Lawn Mower Front Wheel Drive JS26 is typical of most lawn mowers. First of all, follow the guidelines in the manual. Prior to starting the lawn mower engine each time, always check the level of oil in the engine. Top up if necessary. Fill up the fuel tank while the engine is cool. Avoid causing a fire from fuel spilling onto a hot engine. If you do spill fuel , allow it to evaporate prior to starting the engine. Change the engine oil on a regular basis as per the manual. Change the engine oil at least annually for the standard lawn mower. However if you use the lawn more often you may need to change the oil more often as well.